We had our first picnic of 2015 over the weekend, and it was glorious. The weather was perfect. Not too hot, not too chilly. A nice breeze, but not blowing your stuff all over the place. Being able to grill outdoors year round is one of the many perks of living in Hawaii. I can never manage to make the right amount of food, though. I’m always a bit distressed that there won’t be enough, and someone will go hungry. Consequently, we have a pile of leftover burgers in the fridge. I decided not to wait around, but to put these ones to good use, and make them in to breakfast. I may have gone a little crazy, but if you’re gonna eat a burger for breakfast, your sanity is already in question, so I say, just go all the way. I started out with a toasted English muffin and slathered it with some Tabasco mayo. Just stir some Tabasco sauce and some mayonnaise together. It’s breakfast, not trigonometry. 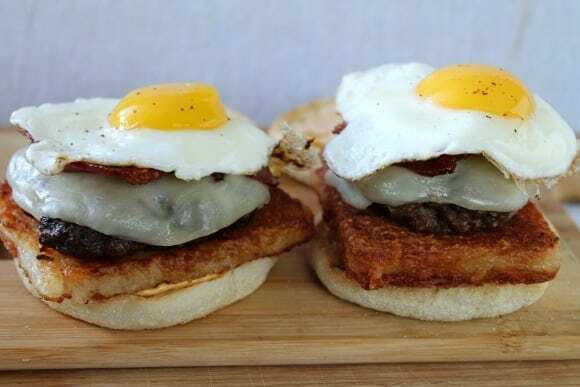 Next I layered on a crispy hashbrown, burger patty, melted provolone, crispy bacon, and a sunny side up egg. It’s a stack of happiness. It might seem like a bit much for breakfast, but if you were at a barbecue the night before, you’re going to want something hearty and greasy to soak up all that alcohol you didn’t realize you were drinking the night before. Or maybe that’s just us. Life is short. 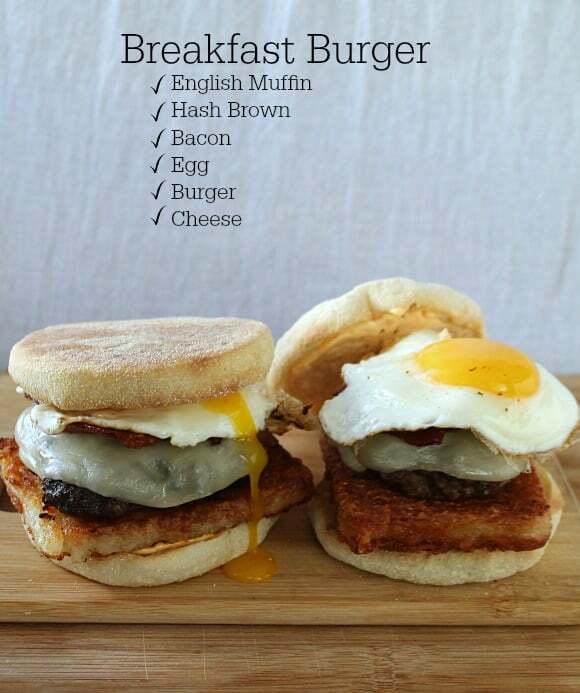 Eat a Breakfast Burger. It’s gonna be awesome! 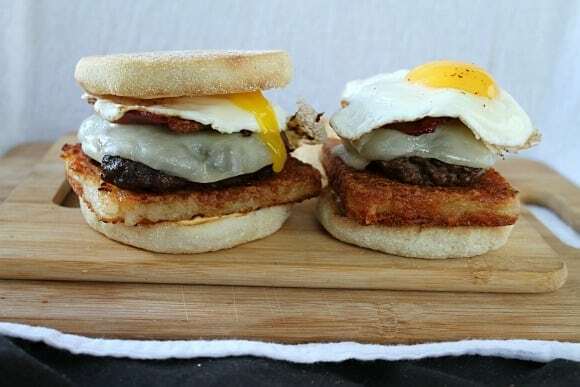 It's a breakfast burger mash up with an English muffin, crispy hash brown, bacon, and a fried egg. In a skillet over medium heat, fry your bacon until crispy. Remove to a paper towel-lined plate. In the same pan, turn the heat up to medium high and add your hash browns, cooking about 5-8 minutes per side or until they're as brown and crispy as you like. Remove to paper towel lined plate. While these two things are cooking, you can also be toasting your English muffins, stirring together your mayo and Tabasco sauce, and microwaving your leftover burger patties. I put mine in the microwave for about two minutes, then add a slice of cheese on top to let it melt. Spread your Tabasco mayo onto each side of your English muffins, put a hash brown on the bottom, add your cheesy burger patty, then break each slice of bacon in half and pop that on the top. You want everything to be ready so you can just slide your egg on top of each burger straight out of the pan. Head back to your frying pan and turn the heat down to medium low. Fry two eggs, sunny side up, or as you like, and season with a bit of salt and pepper. Slide your eggs, runny yolks required, onto the top of your burger, and put the lid on. Dig in, make a mess, and enjoy.